Situation is on hold until city council meets again to discuss whether the code might be amended. (Scott Sommerdorf | The Salt Lake Tribune) Janis Zettel with her VW Beetle named Lucy sitting in the poplar tree in the front of her Clearfield home, on Wednesday, Jan. 10, 2018. 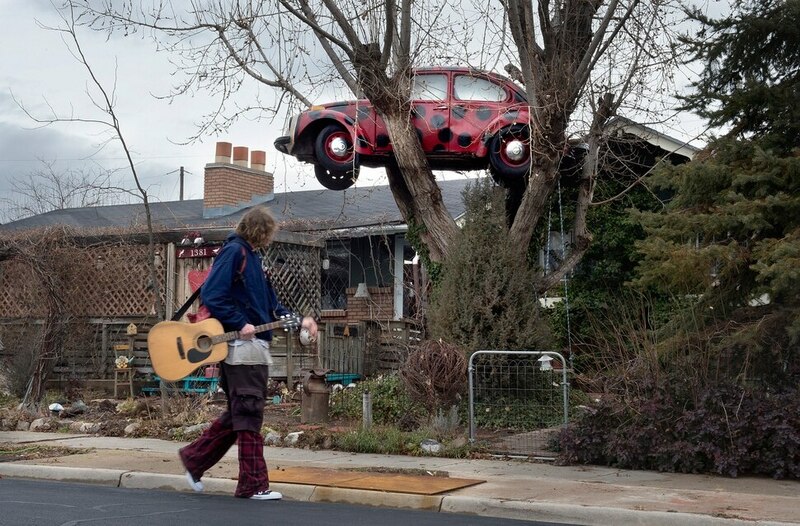 (Scott Sommerdorf | The Salt Lake Tribune) A passerby walks past Janis Zettel's VW Beetle named Lucy siting in the Poplar tree in the front of her Clearfield home, Wednesday, January 10, 2018. (Scott Sommerdorf | The Salt Lake Tribune) Janis Zettel's VW Beetle named Lucy is securely fastened to the poplar tree in the front of her Clearfield home, on Wednesday, Jan. 10, 2018. (Scott Sommerdorf | The Salt Lake Tribune) Janis Zettel's VW Beetle named Lucy, sitting in the poplar tree in the front of her Clearfield home, on Wednesday, Jan. 10, 2018. (Scott Sommerdorf | The Salt Lake Tribune) Janis Zettel's VW Beetle named Lucy siting in the Poplar tree in the front of her Clearfield home, Wednesday, January 10, 2018. (Scott Sommerdorf | The Salt Lake Tribune) Janis Zettel with her VW Beetle named Lucy siting in the Poplar tree in the front of her Clearfield home, Wednesday, January 10, 2018. (Scott Sommerdorf | The Salt Lake Tribune) Janis and Roy Zettel with the VW Beetle named Lucy sitting in the poplar tree in the front of their Clearfield home, on Wednesday, Jan. 10, 2018. 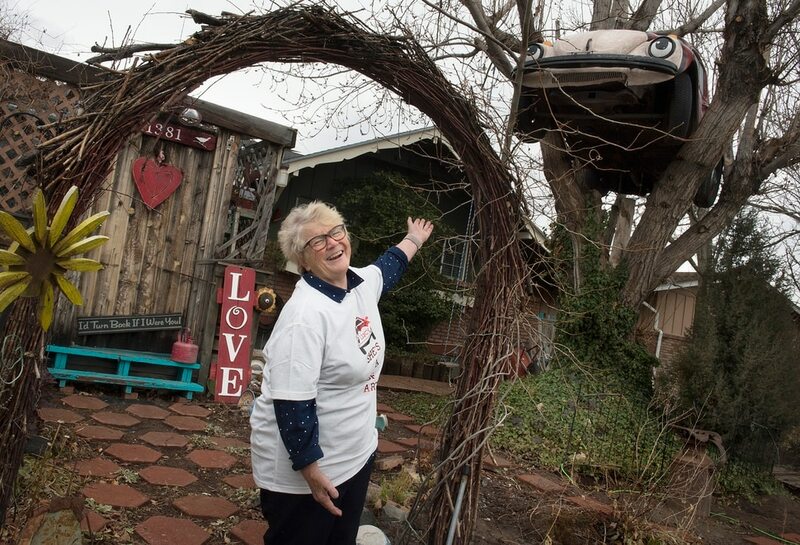 (Scott Sommerdorf | The Salt Lake Tribune) Janis Zettel wears a T-shirt in support of her VW Beetle named Lucy sitting in the poplar tree in the front of her Clearfield home, on Wednesday, Jan. 10, 2018. A bug hanging out high in a tree is hardly noteworthy. Unless, of course, it’s a Volkswagen Beetle, in which case it will raise eyebrows and apparently result in police involvement. 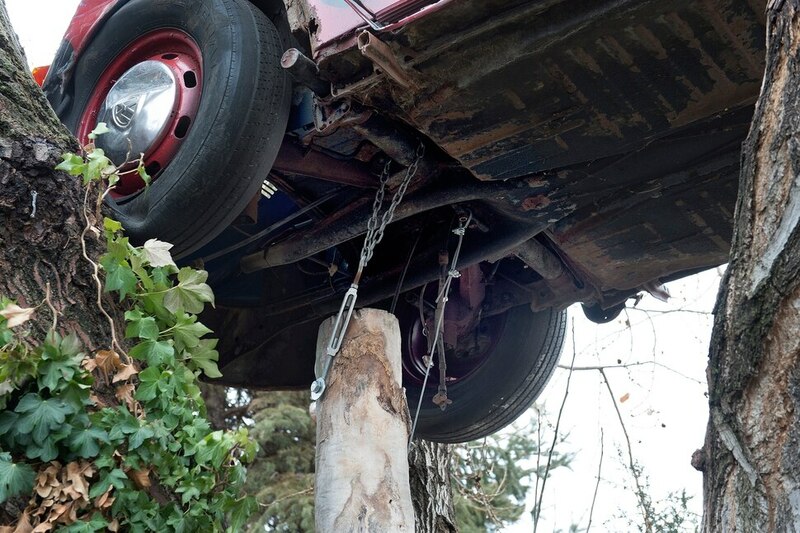 Janis Zettel, a 64-year-old resident of Clearfield, is at odds with the city after a complaint about what she considers a whimsical art installation — a gutted VW bolted into the branches of a tree in her yard — led to a “nuisance vehicle” ordinance citation and an order to take it down. Zettel said she was just trying to do something fun in an area where people don’t necessarily have a ton of money to spend beautifying their yards. Zettel said she and her husband, Roy, stripped the vehicle so that it wouldn’t weigh any more than the treehouse it’d be replacing. After that, they sealed it up so that no one could get into it, painted it like a ladybug, lifted it with the assistance of a neighbor’s forklift, and bolted it into place. She said all the neighbors who’ve bothered to speak to her about it expressed support and admiration. At least one apparently did not feel the same, though. Clearfield Assistant Chief of Police Kelly Bennett said that “a civilian-generated complaint” led to an ordinance enforcement investigation. In the end, Bennett said, even though the VW is mostly a shell of a vehicle, the enforcement officers really didn’t have any wiggle room. By the letter of the code, he said, it’s no different than a junker up on blocks in somebody’s yard. Which is not to say the Beetle is coming down right away. Zettel launched a Care2 petition online asking people to support her effort to keep it, which as of Wednesday afternoon had garnered more than 800 signatures. At a Clearfield City Council meeting Tuesday night, she was able to make an impassioned appeal. And while that request was initially denied — “They had their mind made up already, said they can’t do it, ‘We’d have to change the code,’” Zettel recounted — a decision was ultimately made to discuss the matter further in a future work session. So for now, Zettel gets a reprieve. However, given that she said she won’t be allowed to attend that as-yet-scheduled session and make her case in person, she conceded she’s not terribly hopeful it will yield a different outcome. Clearfield City subsequently responded that no such decision would be made without allowing Zettel the ability to provide further input, however. Clarification: Jan. 12, 9:30 a.m. • The story has been updated to include an official response from Clearfield City about the meeting to discuss the ordinance.